Glass and Halloween are coming to San Diego Comic-Con. The largest pop culture event of the year is just around the corner and while some of the major players are skipping out this year, plenty of studios are using the convention as an opportunity to build some hype for some of the major upcoming releases. Blumhouse Productions is using the event to promote two highly-anticipated genre titles that are quite different from one another but will likely draw equal levels of excitement from those in attendance. M. Night Shyamalan will return to San Diego Comic-Con this year to present Glass, which serves as a sequel to both Unbreakable and Split. The studio previously debuted footage from the movie, which has already completed filming, at CinemaCon earlier this year. What was shown was given a very warm reception and it looks like they're ready to showcase the sequel in a more public setting. Glass is expected to showcase in Hall H, which is the biggest and most prestigious venue at SDCC. The trailer will almost certainly be shown and it seems very likely they will release it online as well. At the moment it hasn't been announced who will be in attendance, but Samuel L. Jackson seems like a pretty safe bet. James McAvoy is busy filming IT 2 and Bruce Willis just may not want to deal with the crowd. Halloween is also set to showcase in Hall H and represents another sequel that fans have been waiting a long time to see. The movie's first trailer recently debuted online and was given a mostly positive reception. That being the case, Miramax and Blumhouse are likely to show off a bit more than just a new trailer. Reportedly, Glass will not be screening in its entirety at SDCC, which makes sense given that the movie doesn't arrive in theaters until January 18, 2019. Halloween, however, opens on October 19 and, while still a little unlikely, it's not out of the realm of possibility that a screening of the movie could be held at the event. Lionsgate made a huge splash when they debuted Blair Witch a couple of years ago. Blumhouse will probably want to keep the movie's secrets safe until closer to the release, but you never know what could happen. Split snuck up on people last year and gave M. Night Shyamalan the opportunity to finally make a sequel to Unbreakable. 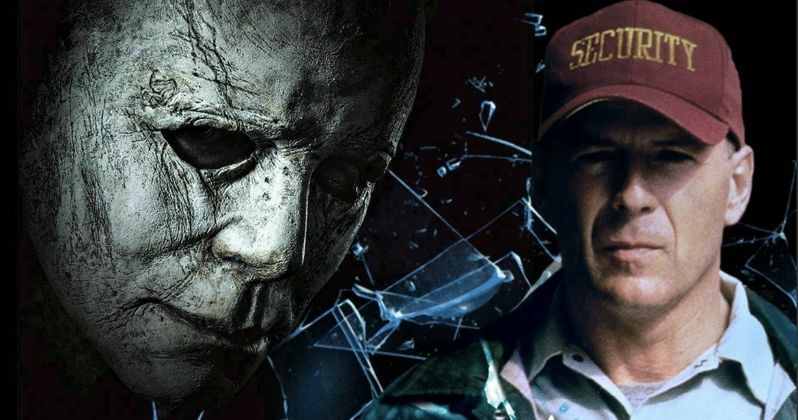 With Halloween, Michael Myers has been absent from the big screen for nearly a decade and this movie is going to serve as a direct sequel to John Carpenter's original horror classic. With Marvel Studios not presenting this year, and with HBO not bringing Westworld or Game of Thrones to the event, someone has to step up and steal the spotlight. Blumhouse looks ready to seize their opportunity and both Glass and Halloween feel like the kind of projects that have show-stealing potential. San Diego Comic-Con takes place July 19 through 22. This news comes to us courtesy of Deadline.